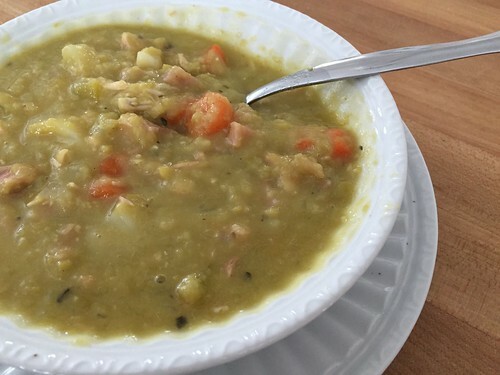 Since we ALWAYS had ham for Christmas, we ALWAYS had split pea soup the week after Christmas to use up some of the extra ham. 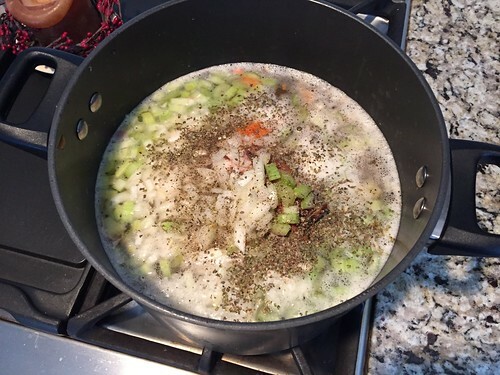 While it wasn’t necessarily my favorite soup growing up, I have come to like it more and more… especially once I realized how super simple it was to make! Served with a slice of crusty bread and a few crackers, it’s a simple, delicious, hearty winter meal. *Note: these are the ingredients I use — however, you can certainly add more or less of the ingredients I’ve listed… or a whole slew of other soup-appropriate ingredients as you wish! 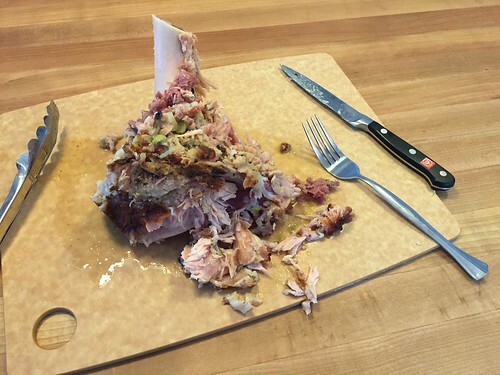 Also, if you don’t have a ham bone, you can just add in chunked ham (or no ham if you want it to be vegetarian). The only reason I boil the ham bone is so the meat will loosen from the bone. In a large stockpot, cover dried peas with 8 c. cold water and let sit for several hours or overnight. 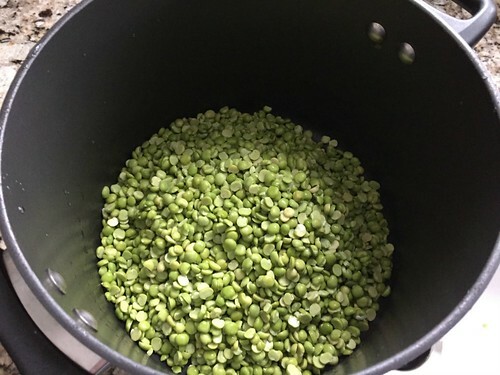 In the morning, drain and rinse peas, then cover with another 8 c. of cold water. Add ham bone and all other ingredients. Bring to boil and simmer for 1.5 hours, stirring occasionally. 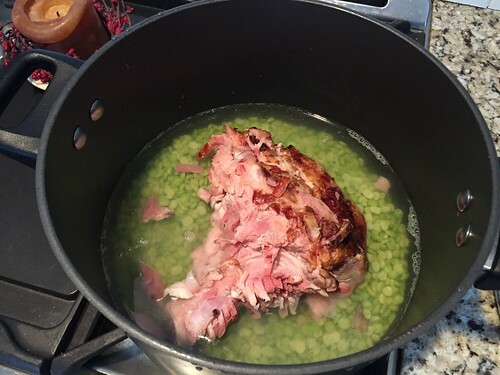 Remove ham bone, cut off ham, add ham back to soup (and any additional ham you’d like to add). I have been told that it is NOT necessary to let the peas sit in cold water for several hours — but that’s just how I’ve always done it, and it’s not an issue for me. 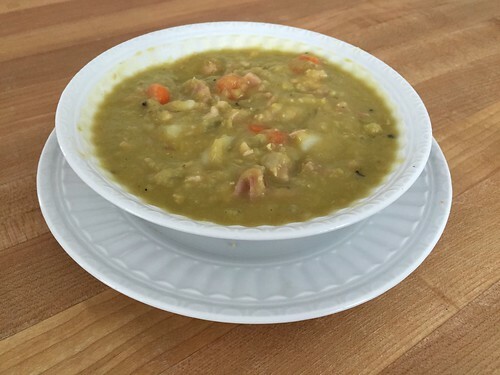 I can simply soak the peas during the day, then add the rest of the ingredients during naptime, and the soup is ready in plenty of time for dinner! This soup is honestly SOOOOO simple to make — if you can chop vegetables and let them simmer, you can make this soup! 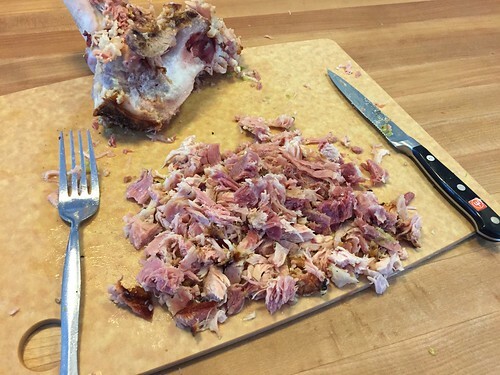 What is your favorite way to use up extra ham? 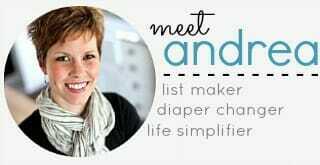 Andrea, I’ve been making split pea soup for years and the base is always the same. 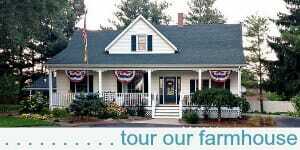 I have always added potatoes to mine and yours is the only other recipe using potatoes. The potatoes add so much flavor. Thanks for the recipe. 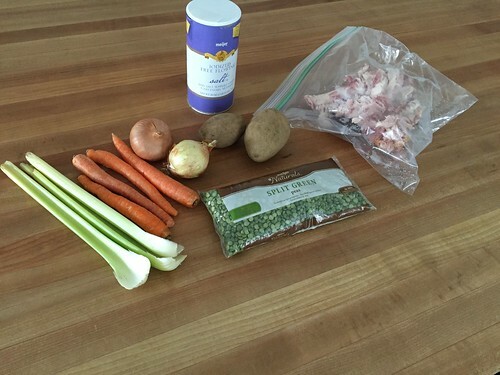 oh good — this is how my parents make their pea soup, and yes, the potatoes definitely add a lot of flavor! I love pea soup, it’s my fave! But everytime I make it it’s watery and not thick. Yours looks thick, is it? If so, how did you get it thick? Did you or have you ever used a stick emulsifier or blender on part of the soup? What do you think of that, as a way to thicken the soup. my soup is quite thick (in fact, I usually add more water when I reheat it as leftovers to thin it down a bit). I do NOT use any sort of blender. I’d just try adding less water to start with and really letting the peas cook down (then when you stir it, the peas basically turn to mush and thicken the soup.) Also, try not adding any salt until the very end. Sometimes salt will prevent the peas from absorbing moisture, so your soup will be runnier and your peas won’t fully cook down. Thank you for this recipe – it was my inspiration for today’s dinner, made with lentils, instead of peas. It was delicious. Hi Melinda! so glad to be your “inspiration” today! Hope your soup was delicious! Made this today; perfect for a cold day. I had all the ingredients in the house, and used up the last of the Christmas ham from the freezer. Dinner smells good! 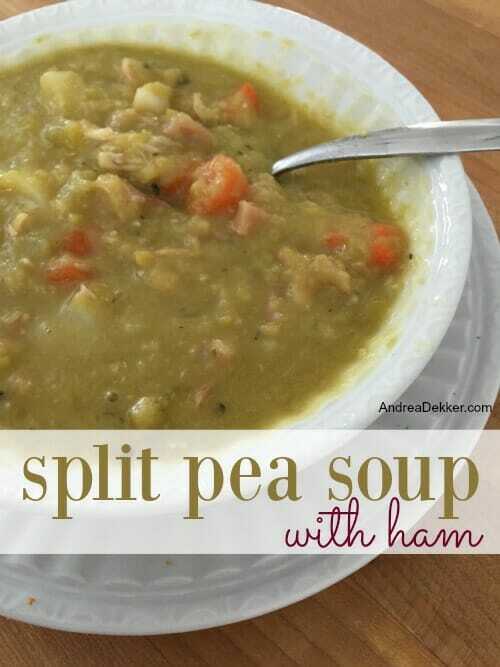 I’ve honestly never tried split pea soup, but this recipe sounds so good! It’s going on my meal plan for next week! Try it! I think (hope) you’ll love it! Yum! Split pea is one of my favorites but other people always give me weird looks. 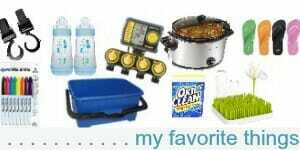 I should make sure to buy the ingredients before our next snow day. I know, it sounds weird (and doesn’t really look super appetizing) but it sure tastes and smells delicious! My crock pot may be a little slow but I find that if I do it in the crock pot it takes a good 8+ hours. Also some key ingredients for me to make the flavor stand out are cracked black pepper, marjoram, bay leaves while cooking, and this time I tried a bit of garlic salt, and celery seed.